The Keystone Kops, with Fatty Arbuckle on the right. Note: Now that Kino has released the second set of videos in their "Slapstick Encyclopedia" series, we've revised our original article to include all eight videos. It's not easy to find silent comedy on television anymore, especially one- and two-reel shorts. Oh, Turner Classic Movies might throw in a silent short on occasion, but they never announce beforehand when they'll be playing. So good luck catching them. That's why Kino's latest series is such an important addition to their video library. The "Slapstick Encyclopedia" is an eight-video boxed set that includes over 50 vintage silent comedy shorts. You'll find many of the comedy giants represented in this series, including Charlie Chaplin, Buster Keaton, Oliver Hardy, Stan Laurel, Harold Lloyd, and Harry Langdon. However, you'll also find many comedians who deserve more recognition, such as Fatty Arbuckle, Mabel Normand, Charley Chase, Billy Bevin, John Bunny, Charley Bowers, Larry Semon, and the French comedian Max Linder. But it's the comic genius of Mack Sennett that is felt most strongly throughout this set. 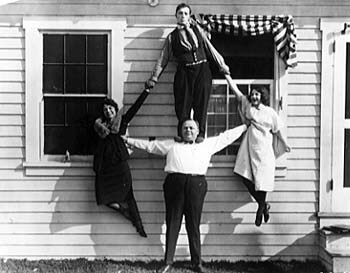 Buster Keaton and Fatty Arbuckle at play. 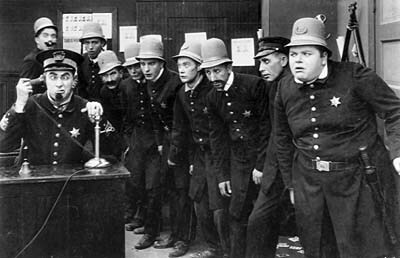 The Sennett comedies were formulaic but inspired, and they frequently concluded with a great chase, often involving a gaggle of Keystone Kops. The motivation for the chases themselves rarely made much sense. Frequently, the motivation was even treated as a joke. In "Wandering Willies," for example, the final chase is motivated when the heroine (Ruth Hiatt) discovers that the villain has dropped a paper of some sort on the hallway floor. She opens it, reads it, her lips form an "oh!" and she goes running to the hero (Billy Bevin). They read the paper together and then off they go. The chase begins. But what does the paper say? Well, the subtitle explaining the contents of that sheet of paper was rewritten several times after shooting had been completed. At one point, the heroine said, "He was stealing my diploma as winner of the beauty contest!" At another, "This proves he is the president of the Kidnappers Corporation!" And yet another version read, "The big clam was trying to get a corner on Muscle Shoals!" Finally, they settled on "Look! A mortgage on Niagara Falls. We must stop it before he shuts off the water!" Total nonsense, yes. And hardly motivation at all. More likely Sennett was making fun of the whole idea of motivation. His product needed an ending and audiences loved chases. So he was simply finding a way to reach the expected ending for a Keystone production--all-out mayhem, with momentum pushing everyone in different directions until the entire effort exploded under the stress. Or in the case of "Muddy Romance," Sennett and a car full of writers took off for Echo Lake when they learned it was being drained. Here was an effect they would normally never be able to afford. They made up the gags and story as they went along. Once again, much of the motivation is sheer nonsense: at the climax, the heroine and her beau suddenly decide to get married in a row boat in the middle of the lake! While the priest conducts the ceremony, the villain (Ford Sterling at his snarling best) turns the water valve (marked "WATER OUTLET--DO NOT TOUCH") that drains the lake and leaves a muddy mess for the Keystone Kops to thrash around in. As in "Muddy Romance," Sennett's comedies could become practically surreal in their wanton disregard for motivation and logic. But by no means was Sennett the only one producing comedies. That's one of the greatest virtues of this huge eight-cassette set from Kino: you'll get a healthy dose of comedy from many of the pioneers. You'll find comedians equally as manic as Sennett's troop, such as Larry Semon in "The Grocery Clerk," Oliver Hardy in "One Too Many" and Ben Turpin in "Mr. Flip," as well as comedians who attempted more sophisticated brands of comedy, such as Mr. and Mrs. Sidney Drew in "Fox-Trot Finesse." You'll find a pre-Stone Face Buster Keaton who screams and cries in very un-Stone Face fashion and a hyperactive Stan Laurel who bears like resemblence to the slow-witted character he would play when teamed with Oliver Hardy. You'll see the headstrong Fay Tincher in a raucous comedy "Rowdy Ann," challenging any notion that silent comedy was a man's domain. You'll see the wildly inventive sight gags of Charley Bowers and Max Linder. In short, this set is as good a primer course in silent comedy as anyone could have hoped for. It's required viewing for movie lover's everywhere. Vol.7: The Race is On! "Slapstick Encyclopedia" is an eight-cassette boxed set from KINO ON VIDEO. Each video has a running time of approximately two hours. Volume 1: "In the Beginning: Film Comedy Pioneers." Volume 2: "Keystone Tonight! The Mack Sennett Comedies." Volume 3: "Funny Girls." And Volume 4: "Keaton, Arbuckle and St. John." Volume 5: "Chaplin & Co.: The Music Hall Tradition." Volume 6: "Hal Roach: The Lot of Fun." Volume 7: "The Race is On!" Volume 8: "Tons of Fun: Comedy's Anarchic Fringe." Suggested retail price: $24.95 each. For more information, we suggest you check out the Kino Web site: http://www.kino.com.